Your day in the garden doesn’t have to end because of nuisances like sunburn, bruises, blisters, muscle aches, or bug bites. The mid-afternoon sun can turn exposed skin tender and red even with precautions like sunscreen or a hat. Calendula Cream, made from Calendula officinalis, a garden marigold, can help relieve sensitive burned skin. 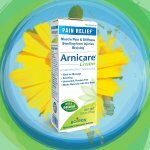 Arnicare Cream, made from Arnica montana, a mountain daisy, can relieve bumps and bruises from digging, pruning, and weeding. Use the cream on sensitive areas such as the face, but never on an open wound. Also, those who bruise easily will appreciate that the cream can reduce unsightly bruise discolorations on exposed legs and arms. If a blister should arise from wearing new garden clogs or gloves, do not pierce it. This exposes the skin to infection. 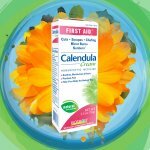 Most blisters heal naturally, but for a speedier recovery, apply Calendula Ointment to the blister after cleansing the area, and cover it with an adhesive bandage. Applying ointment to the area before wearing shoes or sliding on gloves helps keep the skin supple and lubricated, therefore reducing the risk of getting blisters. Whether you are pulling weeds or shoveling mounds of mulch, you can rely on non-greasy Arnicare Gel because it absorbs quickly into the skin and provides relief for stiffness, aches, and pain. Small burns from a grill or outdoor fireplace may need more time to heal than minor sunburn. Immediately place the skin under cold water for two minutes to reduce pain and damage to the skin. 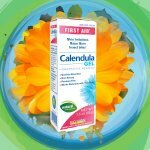 Then apply calendula ointment to help protect, soothe, and heal minor burns. Our skin can be exposed more to the elements during warm weather than during cold. Rub Calendula Cream into cracked heels, and apply Calendula Ointment to chapped lips dried out from the sun or wind. 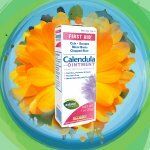 Calendula Gel can provide relief from stinging skin irritations. Apply a thin layer to the area where the bite or sting occurred three times a day or as needed.